Little, Brown Books for Young Readers, 9780316098830, 40pp. Extraordinary collage artwork from beloved illustrator Marc Brown (Arthur series) pairs with Eric Pinder's hilarious rhyming verse to make this the perfect book to read aloud again and again. Marc Brown is the creator of the bestselling Arthur Adventure book series and creative producer of the number-one children's PBS television series, Arthur. He has also illustrated many other books for children, including Wild About Books and Dancing Feet!. Marc lives with his family in Tisbury, Martha's Vineyard. 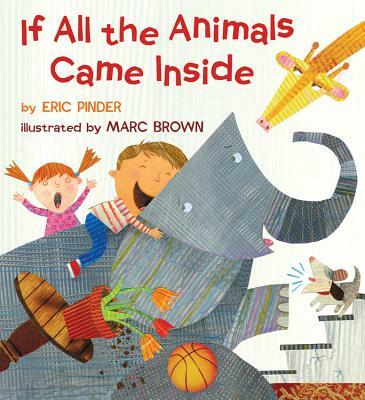 Eric Pinder is the author of the non-fiction picture book Cat in the Clouds, published by The History Press in May 2009. He has also written a number of books for adults, and has been published in national magazines, including Slate and Newsday. Eric teaches at Chester College of New England and has an MFA in Writing for Children & Young Adults from Vermont College of Fine Arts.